Father and son Brock Callen senior (left) and junior spoke about their voyage aboard the R/V Falkor. Brock would not be allowed in the water. At first, professional kiteboarder Brock Callen junior could barely believe his ears. 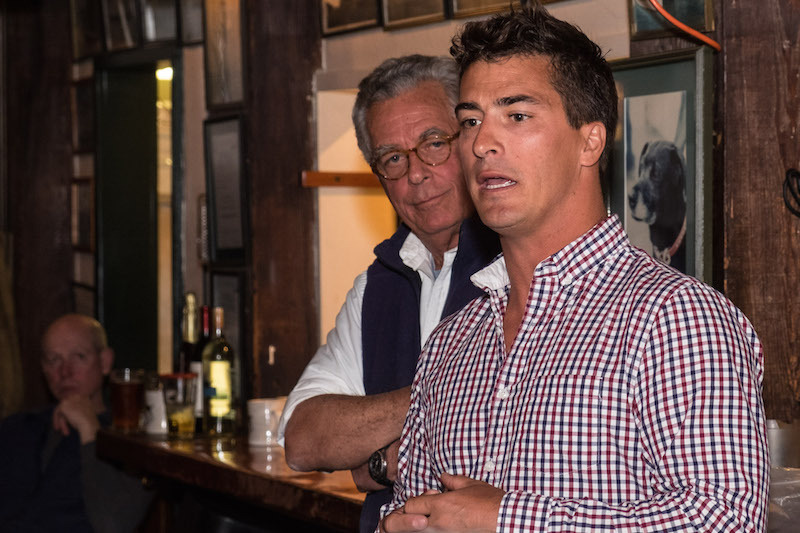 He and his father, Sail Martha’s Vineyard executive director and well-known maritime instructor Brock Callen senior, were about to spend two and a half weeks steaming across the Pacific aboard a research vessel, and they weren’t going to be allowed off the ship. Son and father boarded R/V Falkor in Guam on Christmas Eve for a voyage to Hawaii that would include using multi-point sonar to map the ocean floor around the deserted Johnston Atoll. The 272-foot-long, steel-hulled Falkor is owned and operated by the Schmidt Ocean Institute, founded by top Google executive Eric Schmidt and his wife Wendy. Named after a lucky dragon in The Neverending Story, a novel by German author Michael Ende, Falkor was originally built in 1981 as a German fishery protection ship. The Schmidt institute has had it refitted into a state-of-the-art ocean research flagship, complete with on-board supercomputers and engines found on only one other vessel in the world. “It just blew me away,” Mr. Callen junior said. Mr. Callen senior, who co-presented Wednesday’s dinner talk with his son, was similarly impressed with Falkor’s “extraordinary capabilities, not only as a ship but as a research vessel,” he told the audience. Among the data Mr. Callen senior shared: Falkor’s fuel tanks hold more than 100,000 gallons. It makes its own water using a multi-step system. A joystick, not a ship’s wheel, controls Falkor’s movement. The crew on this voyage represented seven nationalities. “You were definitely the geek of the ship,” said his son with a smile. For his part, one of the first facts Mr. Callen junior discovered on board was that his gift for the captain, a fine bottle of scotch, was contraband on a vessel that permits only beer and wine. Falkor’s standing crew of 21 is augmented on research voyages by invited guests like the Callens — representing ocean athletes and the sailing community — as well as artists, writers, scientists, teachers and students. The Callens themselves were both students and teachers. As they learned about, and assisted in, the vessel’s research mission, they also taught 15 ship-to-shore lessons to students in Edgartown, at the regional high school, in other states and even in the Dominican Republic. The ship’s multilingual crew could help with translations when needed, but there was another challenge to surmount: Working across the international dateline, in a time zone far removed from the classrooms at the other end of the ship-to-shore Google Hangouts link, Mr. Callen senior had to teach his regional high school maritime sciences class online in what was, for him, the middle of the night. “Want to talk about messing with your biological clock?” he joked. One of the most remarkable experiences for both men was watching the monitors in the ship’s science lab as Falkor passed over the Mariana Trench — the deepest place under Earth’s seas. The deepest part of the Mariana Trench is just over 10,000 meters, said Mr. Callen junior. With so much going on in the science lab, “we didn’t spend a lot of time on deck,” said Mr. Callen senior. “We were literally too busy down below.” When they did venture out, the Callens rarely saw any other sign of human existence: two ships, and what may have been two Chinese fishing boats, during the entire voyage. “You get up there and you realize, I am looking at thousands of miles of sea in every direction that I look. I’m a long way away,” Mr. Callen senior told the Black Dog audience. Mr. Callen junior said he never got used to missing the feel of a sailboat heeling over, and the hush that comes after an engine is switched off and sails take the wind. 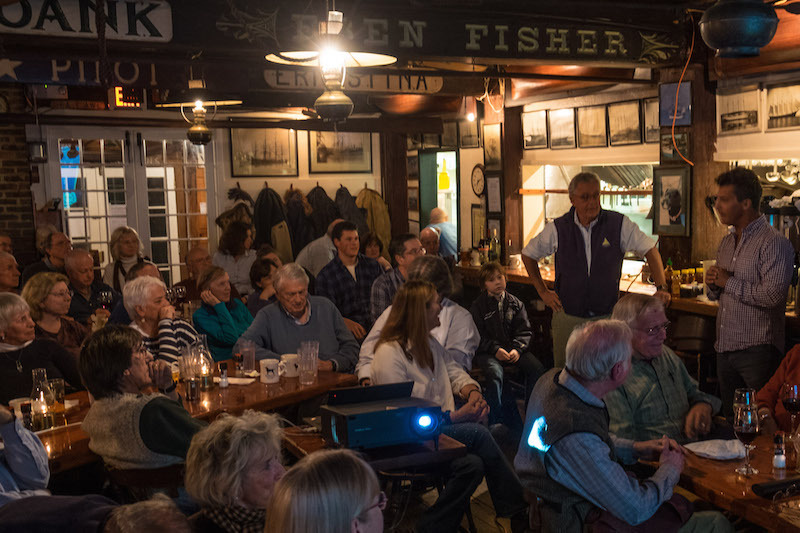 At their talk, the Callens also tackled the question of what will happen with data from the Schmidt Ocean Institute’s undersea survey. It could be used to target minerals for extraction, such as cobalt, a key element in screens for mobile phones, tablets and other devices. “China has the largest resource” of cobalt, Mr. Callen senior said. “The next largest resource is on the ocean floor,” in metallic fists called polymetallic manganese nodules. These undersea lumps take 50 million years to grow by one millimeter, Mr. Callen junior said. The ocean-floor maps that result from Falkor’s survey can also be used to put conservation ahead of mineral extraction, Mr. Callen junior added. “It’s important they map first,” he said. Falkor is headed next for a few months of refitting in port, they said. On behalf of Schmidt Ocean Institute, we would like to clarify the question of what will happen with data from the undersea survey on the mapping cruise. Like all expeditions onboard of research vessel Falkor, the data will not be used to target minerals for extraction, such as cobalt, but will be made publicly available for important research through science repositories. The maps are used by the science community for further research expeditions to help better understand these deep sea ecosystems, and potentially inform managers so that they can provide better protection of the areas that could be potentially altered from other human interests. To learn more about our data sharing and the expeditions currently onboard of Falkor please visit www.schmidtocean.org.